The Fourth of July is an important holiday that celebrates the adoption of the Declaration of Independence. While the holiday is traditionally celebrated with fireworks and barbecues, it’s important to show your children the true meaning behind Independence Day and why we celebrate it. With these fun and educational Fourth of July activities from Hussain al Nowais, you can enjoy the holiday with your family while also commemorating its vast importance. Learn about the Declaration of Independence – In between enjoying fireworks and the family barbecue, teach your children about the Declaration of Independence. Explain to your kids the significance of the document and about all the signers. Wear red, white and blue – Our nation’s colors have meaning behind them. Red represents hardiness and valor, white represents purity and innocence and blue symbolizes vigilance, perseverance and justice. 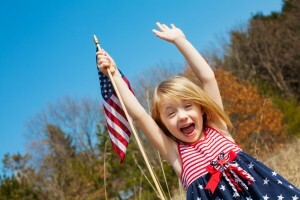 Teach your children about what the flag symbolizes and encourage them to wear red, white and blue or flag-themed clothing to celebrate America’s independence. Fly the American flag – Display the American flag at your home in honor of the Fourth of July. This is the perfect time to teach your children about flag etiquette. Show them how to properly handle, fly and fold the flag. Sing patriotic songs – Singing patriotic songs is both fun and educational. Teach your kids the lyrics to America’s popular songs, including the Star Spangled Banner, America the Beautiful and Fifty Nifty United States. Make care packages for the troops – Teach your kids about the special men and women who serve and protect our country by making care packages for our troops overseas. Make a care package with goodies and homemade cards. Have your children create a handmade card or picture that explains what American means to them. How will you and your children celebrate the Fourth of July?